Evaluator: F. Hornischer, owner of Timelines World's Best Award. Now all pages of this beautiful and interesting site are valid XHTML 1.0, long pages have up to top links. Alan has continued to explore his family's history and this has led to a number of new research projects - particularly in the PURPLE pages. He also changed the appearance of the "lead-in" pages to each of the colour sections, moving to a "collapsible" three column spread which uses more of the available screen space on wider screen format monitors. He has tried to maintain backward compatibility with older browsers and screen resolutions but has also sought to answer the increasingly voluble criticism of the vast majority of our readers and users who use 1024x768 and above. The Craxford family can trace its ancestry back to 1620 in the village of Gretton, Northamptonshire. Over time the branches have spread outwards from these rural East Midlands origins to Australia and South Africa and recently over the Atlantic to the United States and Canada. The magazine now has eight parts (each colour supplement featuring a different family line) managed by over a dozen associate editors, index part and awards pages. You can find articles, editorials and letters, photographs and birth, marriage and death certificates and census studies. The pages are easy to navigate, with a "What's New?" link to the latest articles and recently added people. All parts you can navigate now with five sections, each of them with drop down sub menus: „ Find, Media, Info, Magazine and now also language“. 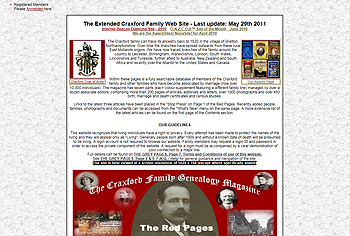 Congratulations, The Extended Craxford Family Genealogy wins World's Best Award. World's Best Award is presented to sites that show unique excellence in content, presentation, design and coding. - Timelines' Top Award.